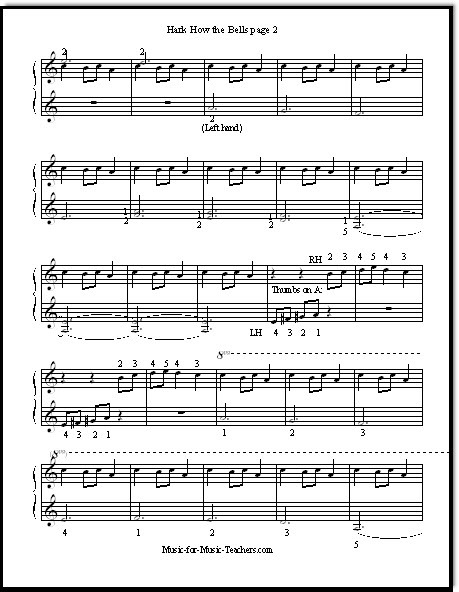 Ukrainian Bell Carol Free Sheet Music for Your Beginning Piano Students! The Ukrainian Bell Carol (also called Carol of the Bells, or Hark How the Bells) is incredibly popular and beautiful. This free sheet music will encourage your beginning piano students to make it sparkle with energy. Though it is very beautiful and flashy, it is surprisingly easy. This ever-popular Christmas song, though originally a choral piece, is a great favorite at my studio. All my students learn it eventually. When introducing it, I always give them just the right hand motif the first week, because it is unexpectedly tricky! A great many of them come back the next week playing four equal quarter notes (sounding like the beginning of the "Dies irae -- Day of Wrath!" not "Hark, how the bells! "), and wondering why all the spark seems to have gone out of the song. I have written an easier version of the Carol of the Bells more suitable for real beginners, using the Middle C notes with which they should be familiar. Though not having the flash and sparkle of this longer version, the beauty of the music still comes through and seems to satisfy kids at the beginning level, and they work at it happily. But a student who is past Level 1 will probably be able to play this song in just a few days, learning the essentials all in one lesson. Just today I showed one of my Level 2 students this piece, and it was a snap for him. Before we even touched the piano keys, we looked through page 1 to see what was happening, then tapped the right hand ostinato rhythm on the piano fall board while I pointed at the left hand melody notes, tapping them with the left hand and singing the melody. The same version, but with "helper notes" (letters in some of the keys) can be found at my page "Note-Naming Worksheets." A harder, fancier version, is found in FJH's In Recital with Christmas Favorites Book 3. 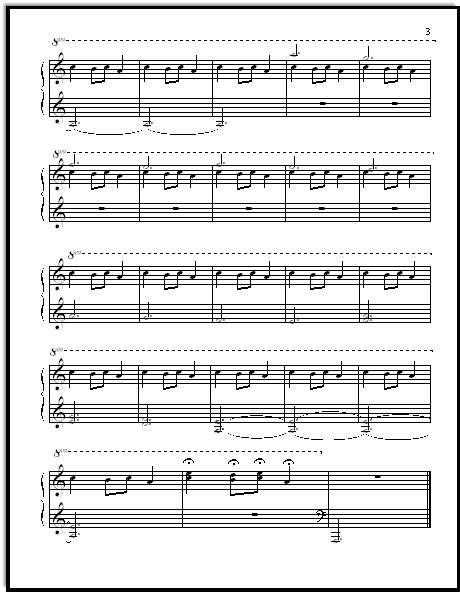 That Gm arrangement incorporates more themes from Ukrainian Bell Carol than my simple version above, and is quite beautiful. And there is a challenging but beautiful and mesmerizing arrangement of the Carol of the Bells in this George Winston book! One of my students played it in recital last Christmas, and she and we all enjoyed it very much. Hark How the Bells is easily learned by rote; I'm not saying not to have them read the notes! 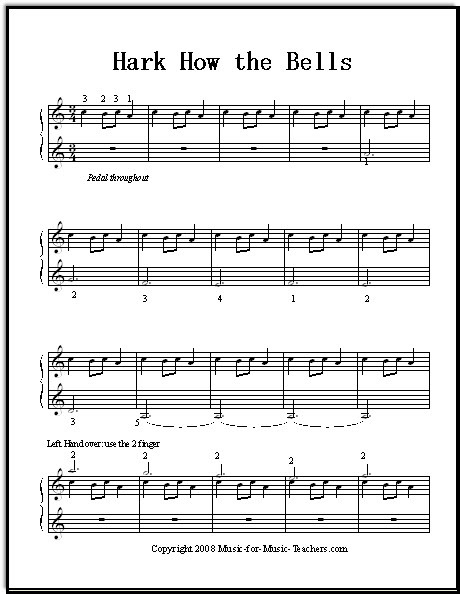 But your kids will be able to PLAY this piece long before they can READ it easily, and long before they meet treble C,D and E in their Faber Piano Adventure books, not to mention f# and g#, which the song uses on page 2. Is it okay to print this? 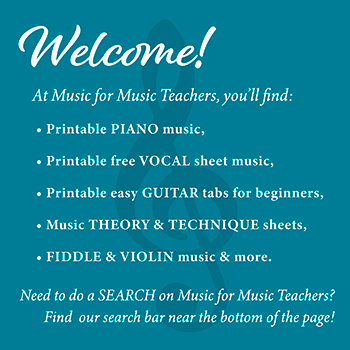 Dana: Yes, I have put this sheet music here for people to use, so you are free to print it out. George Winston's Version of Carol of the Bells - Can I Get It from You?